The goal of the summit is to have attendees leave empowered. The foundation, a nonprofit organization, is dedicated to providing funding for lower-dollar projects on the campus to maintain the college as a leader in educational opportunities for everyone, said the release. 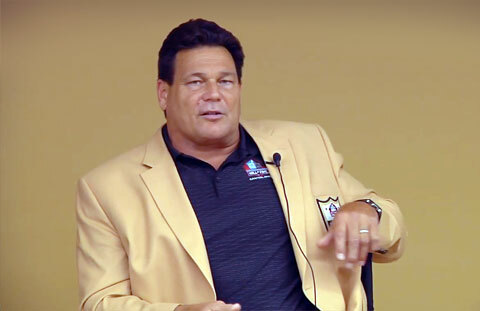 Watch Dan Hampton share stories from his career with Hall of Fame visitors. Hampton is a retired NFL defensive tackle who played twelve seasons for the Chicago Bears from 1979 to 1990. He was a member of the 1985 Bears Super Bowl champion team and was elected to the Pro Football Hall of Fame in 2002. Playing Field Promotions is a booking agent for motivational sports speakers and celebrities. If you would like to book Dan Hampton for a speaking engagement or personal appearance, contact Dan Hampton’s booking agent for appearance & speaker fees at 1.800.966.1380.